CarGurus has 297 nationwide 5 Series Gran Turismo listings starting at $7,550. Now in its fourth year of production, the BMW 5 Series Gran Turismo midsize 5-door luxury hatchback receives a few new updates for 2013, including a new V8 engine and a new auto start/stop engine feature that helps improve fuel economy. Created in the tradition of grand European touring sedans and road cars, the Gran Turismo combines the best attributes of a coupe and a station wagon, offering high-end luxury, sport-oriented handling and plenty of room for luggage in the rear cargo space, accessed by a unique dual-access tailgate. Owners can open the tailgate's lower trunklid to stow smaller items or open the full SUV-like hatch to load larger items. The power-operated tailgate features a soft-close feature and a low loading sill for easy access. BMW offers the Gran Turismo at 535i and 550i trim levels, with rear-wheel drive (RWD) and xDrive all-wheel drive (AWD) powertrain configurations at each level. For 2013, the 550i trims receive a new 4.4-liter, twin-turbocharged N63Tu V8 engine shared with the new 2013 BMW 650i Gran Coupe. The V8 boosts horsepower for the Gran Turismo to 445 hp, up from 400 hp the previous year, while torque tops out at 480 lb-ft at 1,750 rpm, an increase of 30 lb-ft over the previous powerplant. The V8 features piezo direct fuel injection, Double-VANOS variable valve timing and a new auto start/stop feature, which shuts down the engine while idling to help conserve fuel. BMW pairs the new V8 with an updated 8-speed ZF Steptronic automatic transmission with Sport and Manual shift modes. The EPA estimates fuel economy numbers of 16/24 mpg for the new powerplant, which requires premium fuel. 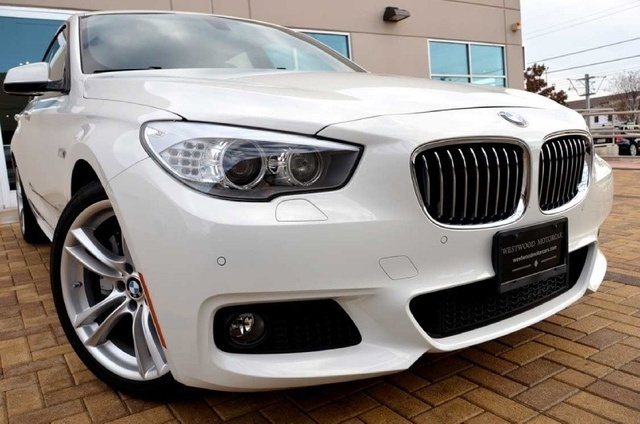 Power for the 535i trims continues to come from a 3.0-liter, twin-turbo V6, which also receives the new auto start/stop feature, as well as piezo direct fuel injection and Double-VANOS variable valve timing. It generates 300 hp and 300 lb-ft of torque, and also connects to the 8-speed transmission. Fuel economy numbers check in at a relatively decent 20/30 mpg. 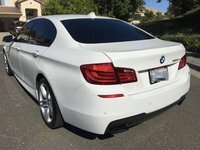 Although it's designated as an extension of the 5 Series lineup, the Gran Turismo sits on a 7 Series platform, and stretches 5.6 inches longer than the other 5 Series sedans (196.8 inches vs. 191.2), allowing for a long, sculpted hood with the twin-kidney grille raked slightly forward. The side windows are segmented into three sections, with the automaker's familiar Hofmeister kink at the back corner of the rear windows, carrying on a traditional BMW design. The sculpted hood, halogen free-form headlights and distinctive daytime running lights with LED corona rings give the Gran Turismo a unique look up front. The flowing roofline descends into a traditional fastback look, finished off with wraparound L-shaped LED taillights in the rear. The Gran Turismo also has a taller ride height than the standard 5 Series vehicles, resulting in a roomy cabin and a unique side profile that gets mixed reviews from critics. The Gran Turismo combines its functional design and good looks with a spirited driving experience. Despite its relatively hefty weight of 4,900 pounds, it jumps out from 0-60 in just 5.3 seconds, thanks in part to the 8-speed transmission, which has the ability to jump 2, 3 or more gears if necessary to respond quickly to the demands of the pedal. Gears change quietly and seamlessly, and the Gran Turismo moves almost effortlessly through its paces, thanks in part to such standard features as an electronic limited-slip differential and a self-leveling rear air suspension. The 4-wheel ventilated antilock disc brakes feature a regenerative braking system, which can sometimes result in an odd brake feel, testers note. However, the speed-sensitive variable-assist, variable-ratio electric power steering provides good feedback and balance. Optional Integral Active Steering provides greater precision and agility around corners or at higher speeds. The regenerative braking system and electric steering systems, along with the auto start/stop feature, are all part of BMW's EfficientDynamics technologies, designed to help improve fuel economy numbers. Overall, the Gran Turismo hits all the right performance-related cues, but it's easy to find a BMW that drives and handles well. The real purpose of the Gran Turismo remains its functionality. Upon its introduction, it replaced the 5 Series wagon in the automaker's lineup of vehicles in the U.S., and although sales remain slow, BMW hopes buyers will increasingly gravitate toward the Gran Turismo and see it as a family-friendly luxury road car. Thanks to its longer length and higher roofline, the Gran Turismo offers plenty of headroom and legroom inside its cabin, as well as generous cargo space. With the rear seats up and in place, the Gran Turismo offers 16 cubic feet of storage space, which expands to 60 cubic feet with the second-row seats folded down. In its typical configuration with a second-row bench seat, the Gran Turismo can seat up to 5 passengers. However, owners can opt for a Luxury Rear Seating Package, which replaces the second-row bench seat with 2 power-adjustable individual seats separated by a center console. Dakota leather upholstery and Dark Wood trim come standard on all trims, although owners can upgrade to Nappa leather upholstery, with Ash Grain Wood trim or Fineline Matte Wood trim available at no extra cost. The front seats feature 10-way power adjustment with 4-way lumbar support and memory settings. Multi-contour front seats with 20-way power adjustment are available. The long list of other standard upscale amenities includes a panoramic slide/tilt moonroof with a 2-piece glass panel, push-button start, automatic climate control, a power tilt/telescopic steering wheel, a leather-wrapped steering wheel and a 12-speaker, 205-watt audio system with HD radio, satellite radio and Bluetooth. A hard-drive-based voice-activated navigation system with real-time traffic and a rear-view camera also comes standard. Drivers can use the vehicle's iDrive controller, located at the base of the center stack, to manage many of the Gran Turismo's tech features. The long list of options, available in a number of packages, includes heated and ventilated seats, heated rear seats, a rear entertainment system, a heads-up display and a 16-speaker, 1,200-watt Bang & Olufsen Surround Sound audio system. The 2012 Gran Turismo was named a Top Safety Pick by the IIHS, and that should continue for 2013. Standard safety features include a full range of airbags as well as Dynamic Stability Control with Dynamic Traction Control, Brake Fade Compensation and a Start-off Assistant. 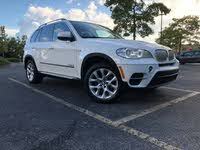 In addition, the BMW Assist Safety Plan, which comes standard, includes such features as automatic collision notification, roadside assistance, remote door unlock and a stolen vehicle locator. All Gran Turismo trims ride on 18-inch light alloy wheels, although wheels up to 20 inches are available as options. 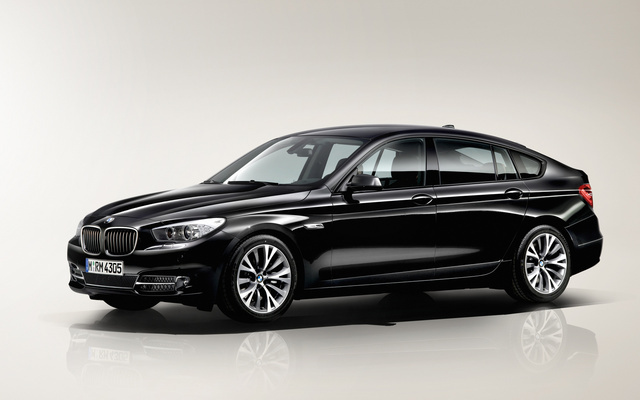 What's your take on the 2013 BMW 5 Series Gran Turismo? 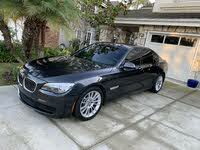 Have you driven a 2013 BMW 5 Series Gran Turismo?